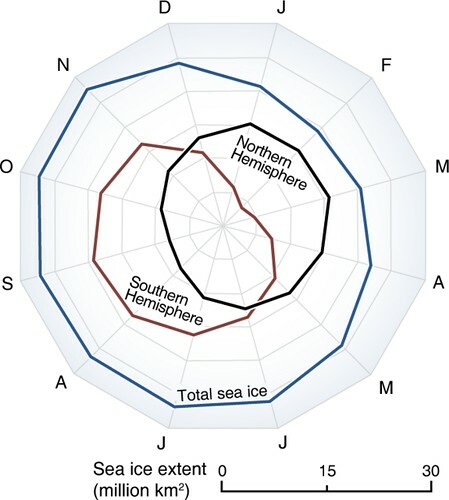 In the Arctic, winter sea ice extends over an area of approximately 15 million km2 at its peak in March and up to 7 million km2 in September, at the end of the summer melt season. 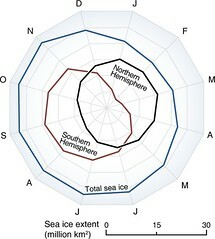 Corresponding numbers for the Southern Ocean around the Antarctic continent are approximately 3 million km2 in February during the Antarctic summer and 18 million km2 at the height of winter in September. In regions with seasonal sea ice, the ice cover achieves a thickness varying from less than 1 metre to more than 2 metres, depending on air and water temperatures and other conditions. In regions where ice survives the summer, thicker, multi-year ice is formed. But these conditions are changing. Sea ice has decreased in the Arctic and is projected to decline much more in both polar regions, with consequences to climate, ecosystems and human livelihoods.